A playful song sung by Shubh Mukherji starring Anand Tiwari, Kabir Sajid, Sanjeeda Shaikh, Alka Amin and Sachin Pilgaonkar. Features: Anand Tiwari, Kabir Sajid, Sanjeeda Shaikh, Alka Amin, Sachin Pilgaonkar. The video of this song is available on YouTube at the official channel YRF. This video is of 2 minutes 28 seconds duration. 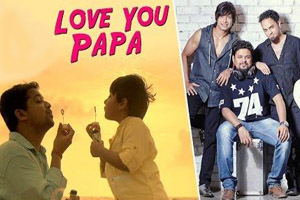 Lyrics of "Love You Papa"
Lyrics in Hindi (Unicode) of "लव यू पापा"